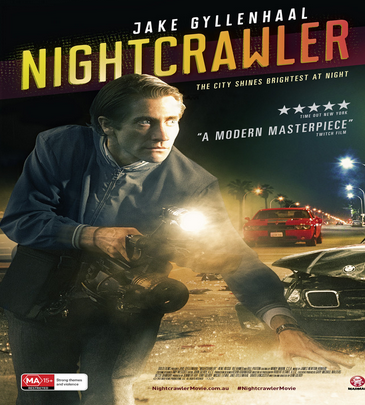 Jake Gyllenhaal in this film is the weird character, Lou Bloom who becomes a freelance news cameraman who roams the streets at night with a video camera and a police scanner in search of bloody accidents or horrible crimes to lead the TV news. He hires Rick, a young man (Riz Ahmed) desperate for work and meets Nina (Rene Russo), a TV news editor who is desperate for good ratings. The result is a creepy type of film noir with this version, showing a part of our society that has lost its moral compass. Lou Bloom is presented as a mentally unbalanced person who sees things in a very concrete manner. He is without a conscience. But the story is more than one man who resembles a person with Asperger Syndrome but without the typical endearing qualities. The movie seems to be making a statement about television news, at least the local news. Not only is it “if it bleeds, it leads”, but we get the impression that local TV news has little or no integrity. This is not a rerun of the famous classical film Network. To the contrary, there was no one to stand up and say that “we are not going to take it anymore.” Instead, we are left with a view that the status quo is really quite disheartening. This sad message is personal to us because the setting is Los Angeles, our town. While we do not usually travel the streets shown in the dead of night, they are all so familiar.